Back-Up Story: "History of the Multiverse - Chapter Seven"
Bart Allen's funeral. Jay Garrick - the Golden Age Flash - speaks first and announces Bart's secret identity and that he was Barry Allen's grandson. High above the Keystone City stadium where the funeral is taking place, Jason Todd, Donna Troy, and Bob the Monitor watch the funeral. Bob is trying to talk them into going into the Nanoverse to find Ray Palmer, the Atom. Cyborg speaks while a disguised Pied Piper and Trickster (disguised as in not wearing their disguises) pay their respects. Wonder Girl speaks angrily about getting revenge on those responsible for Bart's death. This spooks Trickster and Piper into leaving the stadium. They're attacked in the stadium parking lot by villains Multiplex and Deadshot. In the "Bleed", the Monarch shows Forerunner the army of forerunners he wants her to take control of. In Metropolis, Holly Robinson is made to feel at home at the Athena women's shelter. She sits in a hot tub. One of the other women talks to her about her experiences with her last boyfriend who was "a real maniac" - she introduces herself to Holly as Harleen Quinzel (i.e., Harley Quinn). Robin speaks at the funeral and introduces a recording that Bart made after Donna Troy died, a message to be played on his death. Bart talks about walking in the shoes of the big heroes and refers explicitly to Kon-El, the also deceased Superboy. Jimmy Olsen (who's there photographing the funeral for the Daily Planet) sees or senses something up in the alcove and rushes up there. He tries to pry open the door but it's locked. He's moments too late - Jason lashes out at Bob; Donna, frustrated with both of them, flies them up into the air. Jason wants to enlist the aid of the hundreds of heroes down below at the funeral in fighting the coming crisis but Bob insists they must find Ray Palmer. What if Ray's already dead, Jason asks Bob. Bob replies that, if Ray's dead, then everyone else is too. As the heroes load Bart's coffin into a hearse, Jimmy Olsen wonders to himself why he's begun manifesting powers now and thinks about Bart's message and what the Joker told him about not seeing the big picture. Is he more than just Superman's pal, he wonders, and does he have what it takes to be a hero himself? In the Bleed, the Monarch tells Forerunner that the Monitors have dispatched someone to exterminate all life on Earth-34, which is apparently the home of the Forerunner race. The Forerunners have been completely exterminated - except for Forerunner herself. She tells Monarch she will lead Monarch's army across the Multiverse and she won't stop until "every drop of Monitor blood is spilled!" Then she'll murder the woman who exterminated her race. The Monitors review the post-Crisis on Infinite Earths, Earth-DC continuity. Without a Multiverse, new heroes pop up everywhere. The JSA disappear, then return. Doomsday "nearly kill[s]" Superman. Parallax rises and, in Hal Jordan's place, Kyle Rayner gets the Green Lantern ring. Identity Crisis. Mindwipes. Omac. Max Lord kills Blue Beetle. Wonder Woman kills Max Lord. Another crisis looms. Main Story - 3: Gone in a flash. Is it just me, or is it taking longer to bury people in the DCU? You'd think, with all the heroes' deaths these past few years, they'd start getting the hang of burial. 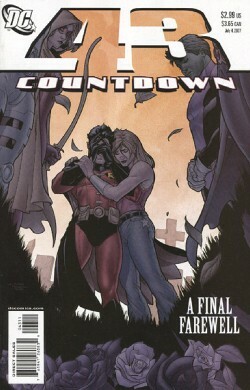 Back when the Earth-1 Supergirl died, her funeral was in-n-out on one page - bagged and tagged in the same issue she had her heroic death, Crisis on Infinite Earths #7. To have Bart talk about his own death is certainly very Bart. But when he starts talking about Donna Troy's death with the previously deceased Ms. Troy and the previously deceased Jason Todd watching the proceedings together, and knowing Wally West is just "Countdown" days from his own resurrection, it minimizes the power that death used to have over comic book readers. Even Bart's ironic reference to Kon-El (i.e., Superboy) feels empty. I'm a bit confused about the Forerunners. I was under the impression that the troops that Monarch has amassed are themselves of Forerunner's race and that they require Forerunner to lead them. So how can Forerunner's race have been exterminated when a bunch of them still exist in the Bleed? Or is it like Superman being the Last Son of Krypton when there's also the cousin, the dog, the Phantom Zone villains, Kandor, etal? Also, with respect to Monarch, is that still supposed to be Captain Atom under the mask? If so, he can't turn back into human form anymore - that's why they put him in the Monarch suit in the first place. So whose human face is that in the Monarch suit? Just when I was beginning to lose interest in Holly's story, in comes Harley Quinn. I'm interested again. Jimmy Olsen's arc is also teetering on the line between interesting and not. The pre-Crisis on Infinite Earths Jimmy Olsen earned the moniker "Mr. Action" because he did have a life beyond being Superman's pal. I just picked up the newly-released trade paperback, "Superman: The Amazing Transformations of Jimmy Olsen" (which I highly recommend by the way) and was reminded that every power that Jimmy's manifested in "Countdown" up till now, he actually possessed at one time or another in the Silver Age. Of course, most times, Jimmy'd get a power in one story that'd be gone by the end of that same story - the "modern" take is for all of this to take forever (or at least 52 issues) to resolve. Though, technically, I suppose, it's still all taking place in just one story. I do wish the writers would decide if Jimmy's role in this series is to be everyman mortal portal into the series or something more - but I'm willing to give them a few more issues to propel his story forward. I'm torn between giving the story a 2 or a 3 this time out - given Harley Quinn's inclusion, and the fact that I'm writing this on a lucky day (07 07 07), I'll up it to a 3. But I expect some pay-off DC - and soon. You're welcome. Main Art - 4: The art is generally OK throughout but I really like the Star Wars-inspired centerfold. George Lucas needed scores of computer generating technicians, computers, and millions of dollars to do what two artists and two inkers make me believe here. Nice work. Back-up Story - 3: An interesting recap of the post-Crisis on Infinite Earths DCU history. The most interesting choice of words was the reference to Doomsday "nearly" killing the Man of Steel. I thought Doomsday did kill Superman and Superman was resurrected - is this a retcon or simply a poor choice of words? Also, while Parallax and the recreation of history in "Zero Hour" is represented, it's interesting that "Zero Hour" itself is relegated to such a seemingly minor place in DCU history. Back-up Art - 4: Jurgens is doing a nice job with the art in this back-up series. While it's classic Jurgens, it's also not so personally his style that my mind doesn't still take me back to the original series' and mini-series from which many of these events are recapped. "Legends", "The Last Days of the Justice Society", Doomsday, "Zero Hour", "Identity Crisis", "The OMAC Project", "Countdown to Infinite Crisis", and Sacrifice from "Wonder Woman" and the Superman titles. Unlike the zombie quality that Sue Dibny had at the end of "52", this recap recreates the Sue Dibny everyone remembers - in life and in death. Max Lord looks like Max Lord and not some generic brunette. It's a very well put together rendering of almost 20 years of history. Cover Art - 3: It's a little too dark for my taste. Also I'd have found a way to include a smiling Bart Allen's picture somewhere on the cover.